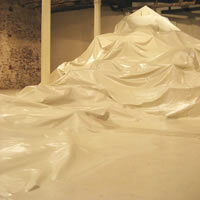 The dominant feature of the installation is a large, cream-colored, mountain -- made entirely from large sheets of canvas sewn and pinned together and painted the color of the gallery floor. The intent is to have this mass look as though it were buckling up under the foundation. The "mountain" gradually rises, over ridges and crevasses, to a height of twelve feet. At its base, it is approximately 50 long and 36 feet wide. 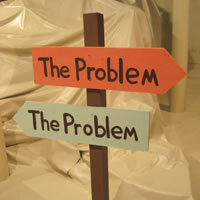 At the foot of the mountain is a sign with two trail-markers, pointing in opposite directions, both painted with the words "The Problem." Built into the mountain's backside, not visible from the entrance of the gallery, is a wooden church facade with a temple top. The facade is loosely based on early Italian Renaissance designs. 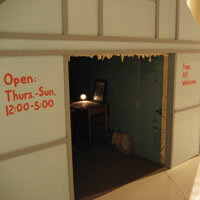 To the left of the door are painted the words "Open: thursday - Sunday, 12:00 - 5:00 p.m." and to the right "Free. All Welcome." The wording mimics that on Triple Candie's 126th Street entrance, and underscores our public persona as a democratically spirited organization. Ducking through the wide but low opening, one enters a ten-foot-deep, cave-like bunker -- lit only by a single camping light. 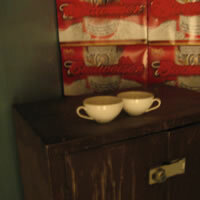 The back wall is made from stacked Budweiser beer cases, with the brand name painted out. The sidewalls are made from blue sheets of foam insulation, with spray foam filling the creases in the walls and ceiling and dripping down like stalactites. 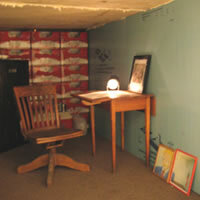 This interior space contains a small table and chair, a military-surplus metal cabinet with two ceramic teacups on its top, an old red cooler, cans of food, and a plastic jub of water. Leaning against the wall are two framed color photocopies that jointly document a David Hammons' artwork: "How Ya Like Me Now" (an image of Jesse Jackson as a white man). Propped up on the desk is a framed photograph of Triple Candie volunteers stacking Budweiser beer cans in an effort to recreate a sculpture by Cady Noland. 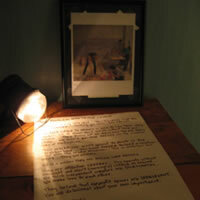 The most important object in the bunker is a handwritten text that lies on the desk. This anti-manifesto articulates a sequence of "problems with Triple Candie," written in an elliptical narrative that alternatives between the first, second, and third person. Some of the problems concerns our facility (e.g. "the floor is way uneven"); some are derived from critiques we've heard from other (e.g. 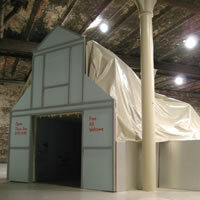 "they have never formed a relationship a relationship with the Studio Museum"); still others are our own projections of what people might think about Triple Candie's programming (e.g. "they don't seem to like artists very much"). The document is sprinkled with a series of unpopular positions Triple Candie holds vis-a-vis artists, independent curators, and nonprofit alternative spaces.